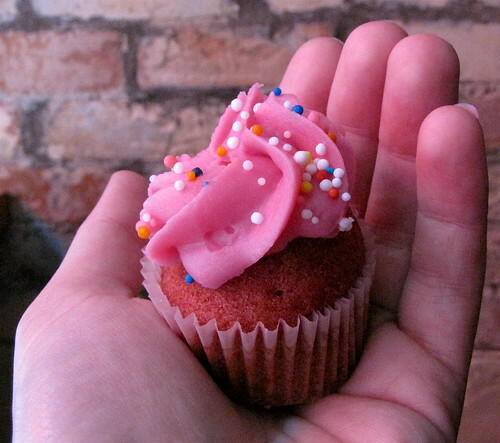 I'm a little late reporting on this: on the 4th, Yelp Toronto hosted a cupcake crawl. About 20 of us tasted and compared the baked goods at eight spots across the city. Here's what I learned on the cupcake crawl: there's no such thing as 'the best ___ in the city', only 'my favourite ___ in the city'. 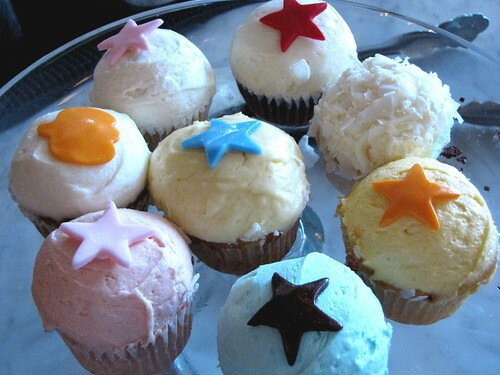 Some people proclaimed the best cupcakes of the day to be the ones I could barely tolerate. So, to each her own. Here's my verdict, in order of the day's tour. Sweet Tooth, 508 Danforth Ave. 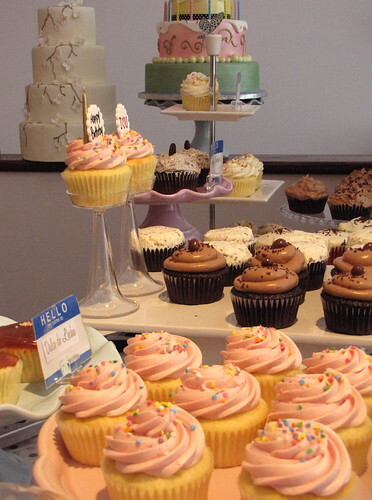 I've had Sweet Tooth cupcakes before. I don't like the icing: it's gluey, greasy and too fake, without much flavour. The cake part is too dense. These may be the prettiest cakes, but I am not a fan. The icing is thick, flavourful and sugary. I love how generously it was swirled over the surface of the perfectly weighted cake. These ones are worth the trip across the city. The cake is so light, it's barely there. The icing is similarly ephemeral. The taste is very much like mass-produced supermarket baked goods. Inoffensive but nothing special. 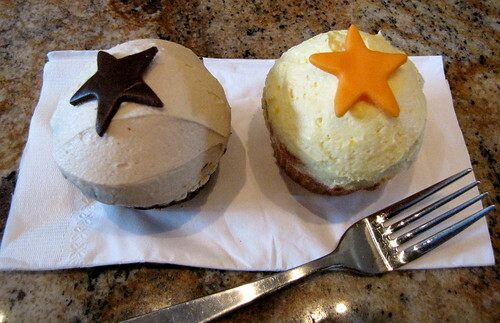 These cupcakes are very sophisticated. Lil' Baci has a whole menu of Babycakes goodies - 16 gourmet flavours! I was really impressed by how natural the icing tasted. The One Love icing had the flavour of real, ripe mango. Everyone raved about these cakes. I have to admit that I prefer cupcakes to have much more icing than these rather grown-up offerings with their mature icing-to-cake ratio. Otherwise, they were wonderful. 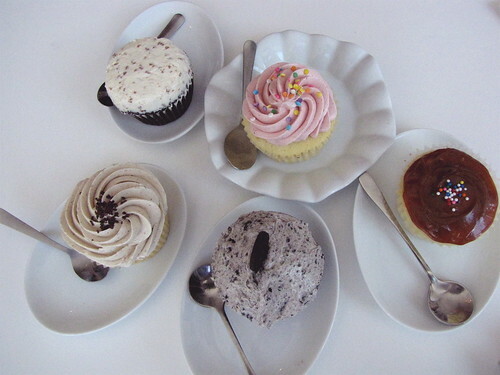 Keep in mind that I'm rating the cupcakes only. Ms. LPK seemed really kind and the store looked great and there were lots of interesting products for sale. 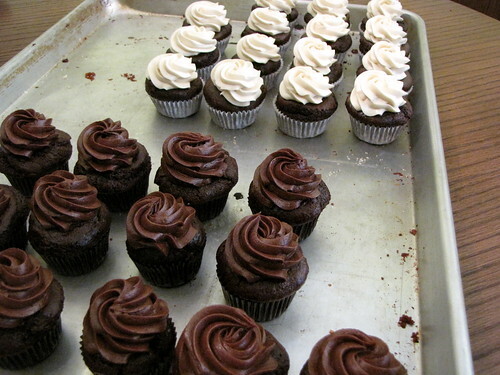 But, I did not like the cupcakes at all. The icing tasted like pure softened butter without any other flavour. The cake also tasted only of butter. It was really unpleasant. Also, the baker told us the cupcakes, available in mini size only, are made daily from whatever leftover batter and icing they have in-store. 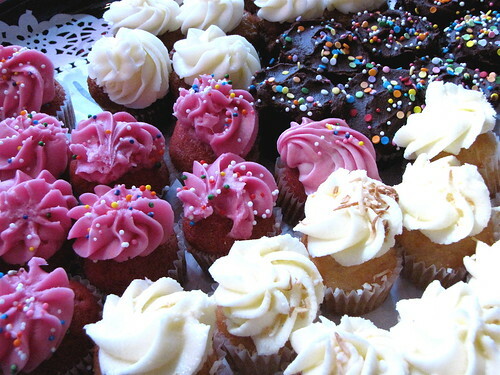 However, each mini cupcake was $2.50! Why so expensive if this is just a use for leftovers? The price was more than a standard size cupcake at most of the other stores. Wow, I am so happy that Cora's is in my neighbourhood because I absolutely loved these cakes. Perfect sugary, gritty icing just the way I like it, a decent cake to bite into without being too dense, high quality Callebaut cocoa. These were my favourite of the day and I will be back many times. I love Wanda's pies, squares and cookies. But the cupcakes? Ew. The icing tasted like soap. The cake was so tough, I could barely swallow it. I don't know how Wanda gets pie so right and cupcakes soooo wrong. Avoid. Well, isn't this just the prettiest little shop around? I was pleasantly surprised to find this place and its tasty offerings just a few minutes walk from my apartment. 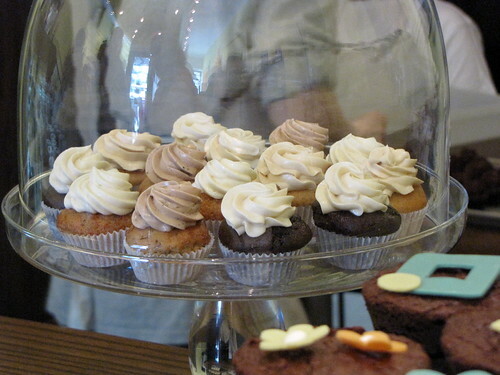 There are interesting flavours of cupcake to choose from, such as spiced chai and dulce de leche. Like Babycakes, the icing and cake textures aren't amazing but overall, these were very good. This may seem like a mistake as Sneaky Dee's is more Tex-Mex punk dive bar than cupcake tea room. 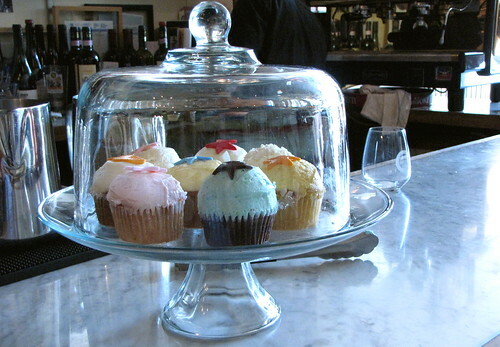 However, every Thursday, Sneak's gets an order of cupcakes to sell for the week. The vegan cake was super dense and it had a slightly off sweetness. However, I liked the pumpkin and chocolate chip combo so much that I was inspired to bake my own batch of pumpkin chocolate chip muffins. I agree Sweet Bliss's cupcakes are freaking awesome. I stopped in there one day by mistake and I've been back a bunch of times. Delicious! Yummy stuff here. More than the taste i like the decorations. I agree...wanda's pie in the sky cupcakes are terrible. I think the one I bought was a month old.